MPTF (Motion Picture & Television Fund) hosted its seventh annual “Reel Stories, Real Lives” event, a unique evening of powerful stories about industry members and their families who have benefitted from MPTF’s services in recent years. Jay Ellis, Glen Powell, Mary Steenburgen, and Aaron Taylor-Johnson served as the storytellers. Each story was written by one of Hollywood’s leading feature and television writers, including Reinaldo Marcus Green, Joby Harold, Kara Holden, and Olivia Milch. The evening was hosted by Emmy Award-winning producer, writer, and actor Keegan-Michael Key. “We are so fortunate to enjoy the support of our entire industry, from the incredible storytellers who wrote and presented last night’s narratives to the engaged audience who came to listen. Once again, the wonderful generosity of the entertainment community was on display and we are very grateful for that,” said Bob Beitcher, President and CEO of MPTF. Ford Motor Company continued their partnership with MPTF as a Presenting Sponsor of the event. FORD’s relationship with the entertainment industry dates back to the earliest days of film when Henry Ford partnered with silent film producers to feature the iconic FORD Model T in the Keystone Cop movies. 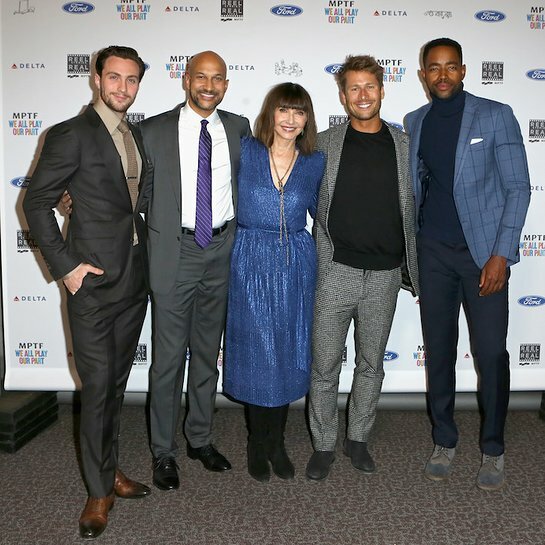 Through multiple events and a grass roots campaign, FORD aims to raise awareness of MPTF while driving funds for the organization through a meaningful collaboration. “Reel Stories, Real Lives” received additional support from Delta Air Lines and City National Bank, an RBC Company. The evening drew approximately 500 industry leaders and celebrity guests and was produced by Cate Adams, Kevin McCormick, Tara Schuster, Greg Sills, and Courtenay Valenti.